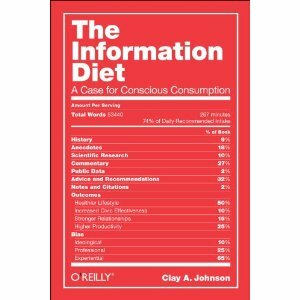 This past summer I had lunch with Clay Johnson, and he told me he was hard at work on a book called The Information Diet. I read an early manuscript copy, and am excited to see that the Kindle version of Clay's book is out as of yesterday. I'm over-simplifying, but his general premise is that we don't have an information overload problem, we have an information obesity problem. In the same way obesity is less a result of too much food and more about the wrong kind of food, our problem today is that we are spending too much time consuming the wrong information, and we're not disciplined enough about how/when/where we consume the right information. After reading his book, I can say he makes a compelling case.